Pulsar LED Time is proud to announce the release of our latest creation! This is our new PLT-2 LED Watch Module that is based on our ultra reliable PLT-1 module. The PLT-2 is a direct replacement module for the Magnet Set 401 & Auto Set 402 Pulsar Modules. The PLT-2 module will replace a faulty broken and non-working modules of the Classic 1970’s Pulsar P4 & Executive models with or with-out the Auto-Command Function better known as the Flick-Wrist Function as well as the Pulsar Big Time vintage LED watches with Red or Green type LED Displays. The original magical LED display from your un-repairable LED watch along with the magnetic reed switches and the plastic carrier are removed from the faulty watch and re-used with the new PLT-2 module, ensuring the same 70's look and function. In this short 10 Minute HD Video we take apart an Omega Time Computer II, also known as the TC2 LED Watch and replace its dead module with a PLT-1 module and get it working again. It also shows how to correctly insert batteries into these Omega, Pulsar and Hamilton LED watches using similar original modules or the replacement PLT-1 Modules. 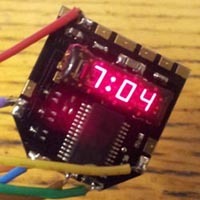 The PLT-1 LED Watch Module is a direct replacement module for the 1970's LED watches made by Pulsar, Hamilton and Omega. The original magical LED display from your un-repairable LED watch along with the magnetic reed switches and the plastic carrier are removed from the faulty watch and re-used with the new PLT-1 module, ensuring the same 70's look and function. Will Repair The Following Watches. Pulsar P2, Module #2900 Single Button Time Only LED Watch. Pulsar P3, Modules #3100, #3013, #3120, #3130 Dual Button Time and Date LED Watch. Omega TC1, Time Computer 1, Calibre 1600, Single Button, Time Only LED Watch. Omega TC2, Time Computer 2, Calibre 1601, Dual Button, Time and Date LED Watch. Hamilton QTC Module #995 Single Button, Time Only LED Watch. Hamilton QED Module #955 Dual Button, Time and Date LED Watch. 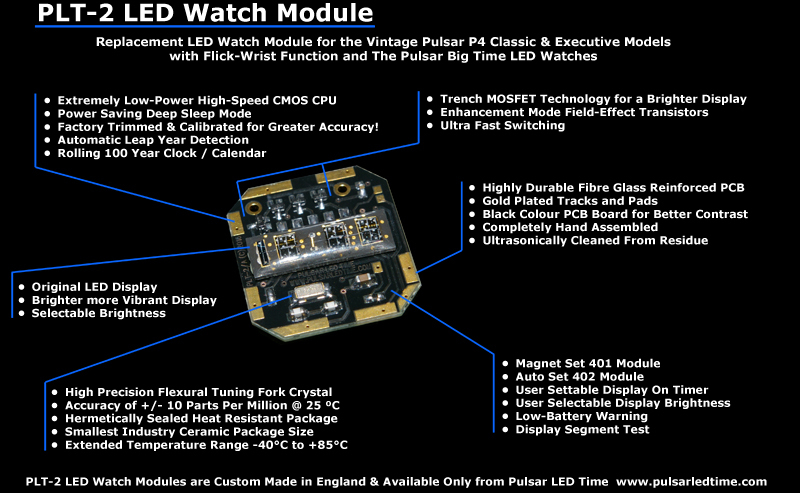 Using the best of modern technology we have recreated all the functions of the original Pulsar watch module plus more! Four modes of operation, two of which faithfully recreates the original functions of a single button Time only Pulsar LED watch or a dual button Time & Date Pulsar watch. The other two modes are Enhanced modes of operation offering additional features not available with the original Pulsar modules. User selectable features through the new configuration menu allows the setting of the modules Operating Mode, Variable Display Time Out and Display Brightness Adjustment as well as Display Segment Test and Soft Reset. The new PLT-1 module also offers higher precision time keeping than the original Pulsar module by using a high precision Flexural Tuning Folk 32.768 kHz Quartz Crystal housed in a hermetically sealed heat resistant ceramic package. 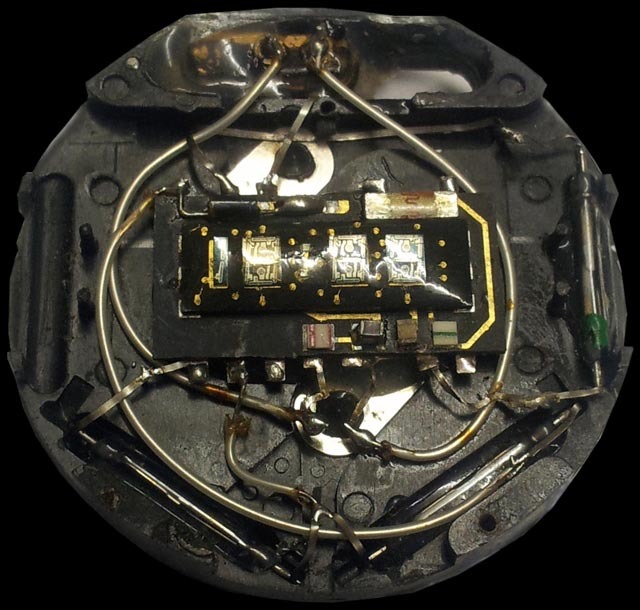 A Blog article on the development of the PLT-1 Pulsar LED Watch Module is here. The User Manual for the PLT-1 Replacement Pulsar LED Watch Module is here. 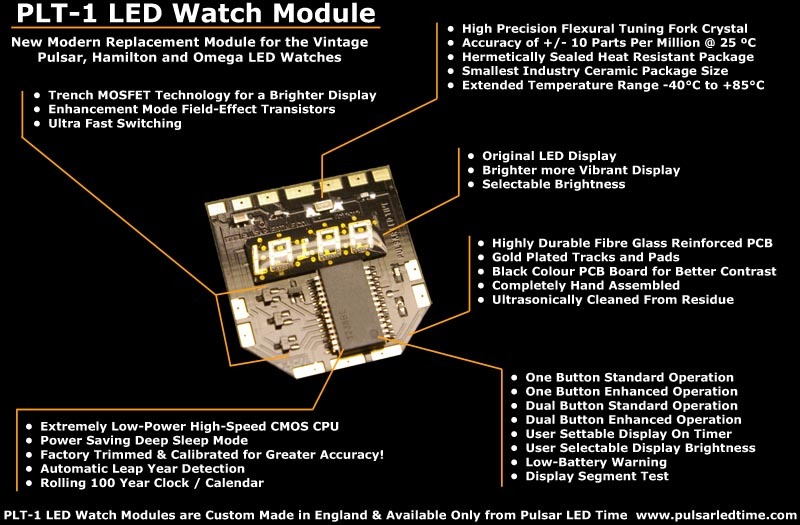 For further details on ordering please visit the PLT-1 Replacement Pulsar LED Watch Module Page. If you have a Pulsar, Hamilton or Omega LED watch that no longer has the original module installed and sadly looks like the picture below, we now have a solution to restoring this type of modules, a legacy of the 1970's repairs. This revised version of the PLT-1 replacement LED module called the PLT-1/P4 would allow the installation of the later P4 LED displays removed from these modified modules, restoring original functionality as well as Magnet setting capability of the original pulsar watch module. The PLT-1/P4 is now available and costs the same as the standard PLT-1 module. Reed switches are not included but are available separately if needed. A 1970's Repair! We have had a few Pulsar LED watches and modules come for repair recently that had been repaired way back in the 1970's and look like the picture on the left, Yuk!! This repair / modification was probably done under warranty by Pulsar or soon after as these modules all look very similar with the same layout and wiring. It was probably a standard Pulsar repair to fix dead watches. Maybe when stocks of the original replacement modules ran out, Pulsar or their service and repair centres resorted to replacing the dead faulty modules with later P4 LED modules that were still in production, running wires all over the place to make everything fit together, what a mess! The early P4 modules were magnet set and the magnet setting was retained in the modification, the later P4 modules were button set. With button set P4 modules, the time and date setting reed switches were no longer necessary and were removed or left unconnected, resulting in a watch that was no longer settable by a magnet! These P4 modules use a different updated LED display with solidly lit LED segments and a different pin out to the original LED displays that were installed on the original modules. To fix these type of modules we developed a revised version of PLT-1 replacement modules which allows installation of the later P4 displays removed from these modified modules. We specialise in repairing and servicing old LED Electronic Watches made in the 1970's by Pulsar, Hamilton, Omega and Zenith as well as some other makes of LED watches. We also repair and service old vintage LC - LCD Quartz watches by Casio & Seiko. If you have one of these old watches that is not working we can most likely restore it to good working order.